Background: Treatment of chronic obstructive pulmonary disease (COPD) with inhaled corticosteroids does not appear to be as effective as similar treatment of asthma. It seems that only certain subgroups of patients with COPD benefit from steroid treatment. A study was undertaken to examine whether inhaled fluticasone propionate (FP) had an effect on lung function and on indices of inflammation in a subgroup of COPD patients with bronchial hyperresponsiveness (BHR). Methods: Twenty three patients with COPD were studied. Patients had to be persistent current smokers between 40 and 70 years of age. Non-specific BHR was defined as a PC20 for histamine of ≤8 mg/ml. 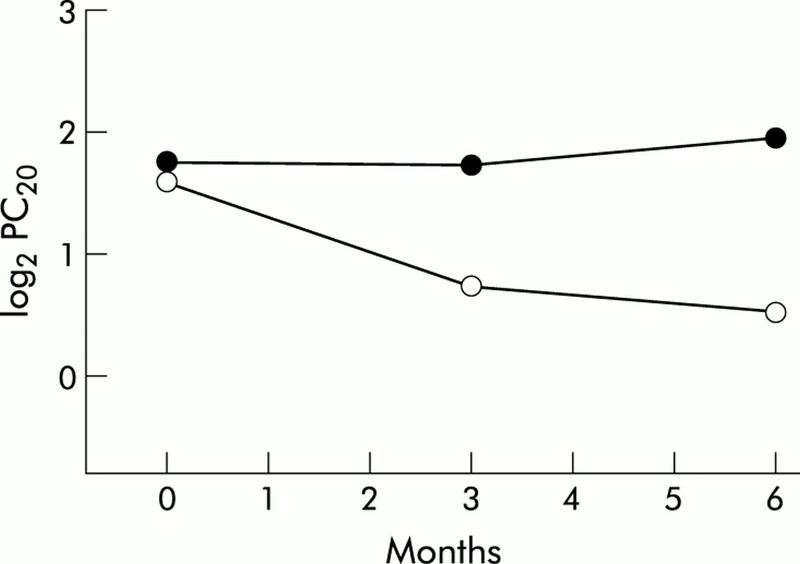 Patients received either 2 × 500 μg FP or placebo for 6 months. Expiratory volumes were measured at monthly visits, BHR was determined at the start of the study and after 3 and 6 months, and bronchial biopsy specimens were taken at the start and after 6 months of treatment. Biopsy specimens from asymptomatic smokers served as controls. Results: In contrast to asthma, indices of BHR were not significantly influenced by treatment with FP. Forced expiratory volume in 1 second (FEV1) showed a steep decline in the placebo group but remained stable in patients treated with FP. FEV1/FVC, and maximal expiratory flows at 50% and 25% FVC (MEF50, MEF25) were significantly increased in the FP treated patients compared with the placebo group. Biopsy specimens were analysed for the presence of CD3+, CD4+, CD8+, MBP+, CD15+, CD68+, CD1a, and tryptase cells. FP treatment resulted in marginal reductions in these indices of inflammation. Conclusion: In patients with COPD and BHR, FP has a positive effect on indices of lung function compared with placebo. Bronchial inflammation analysed in bronchial biopsy specimens is only marginally reduced. Inhaled corticosteroids are used in the treatment of asthma, but the beneficial effects of steroid treatment in COPD are debatable. The improvements in lung function parameters, which are characteristic of steroid treatment in asthma, have not been unequivocally found in patients with COPD.4–7 It has been postulated that, if steroids are important in the treatment of COPD, they act via downregulation of cytokine and adhesion molecule expression with a consequent reduction in cell migration and activation.8 To date, only a limited number of studies have examined the effect of steroid treatment on inflammation in COPD. A study was therefore undertaken to determine whether patients with COPD and BHR would benefit from treatment with fluticasone propionate (FP), an inhaled steroid. Twenty three patients with COPD were selected according to generally accepted criteria (chronic productive cough, FEV1 ≤70% of predicted normal value, FEV1 reversibility of <10% predicted after 750 μg terbutaline administered by metered dose inhalation, negative serological examination (Phadiatop test), and negative skin prick tests for standard inhaled allergens).22 Patients with an FEV1/inspiratory vital capacity (IVC) ratio of <0.70 were also included, provided their total lung capacity (TLC) was greater than the predicted value + 1.64SD. Reference values were obtained from ECGS standards.23 Participants had to be current and persistent smokers aged 40–70 years. Non-specific BHR was defined as a concentration of histamine provoking a fall in FEV1 of 20% or more (PC20 histamine) of ≤8 mg/ml. FEV1 had to be >1.2 l to ensure complete safety in view of the bronchial provocation tests. The characteristics of the patients are listed in table 1. Subjects were excluded if they had a history of asthma characterised by attacks of dyspnoea, chest tightness or wheezing, respiratory tract infection in the 4 weeks preceding the first visit, or were suffering from serious or unstable concomitant disease. Eligible patients using anti-inflammatory treatment including non-steroidal anti-inflammatory drugs were asked to refrain from oral prescriptions for at least 3 months and from inhaled corticosteroids, sodium cromoglycate, or nedocromil sodium for at least 6 weeks before the start of the study. Long acting β2 agonists, xanthine derivatives, and antihistamine drugs also had to be stopped at least 6 weeks before the start of the study. Patients whose symptoms or lung function deteriorated after discontinuation of drug treatment were excluded from the study. Six asymptomatic smokers with a normal maximal expiratory flow-volume (MEFV) curve, PC20 histamine >8 mg/ml, and absence of allergy (negative Phadiatop test) served as controls (table 1). The hospital medical ethics committee approved the study. Written informed consent was obtained from all participants. The study was double blind and placebo controlled with a treatment period of 6 months. The design is schematically presented in fig 1. During the 2 week run in period, subjects underwent lung function tests. Eligible patients were randomly allocated to either the treatment group (n=10) who received 500 μg FP twice daily via a Diskhaler, or to the placebo group (n=13) who received their prescription via a similar device. Salbutamol via Diskhaler was given as rescue medication. Inhalation of ipratropium bromide was allowed at a constant dosage. Bronchial biopsy specimens were collected at the start of the treatment period and after 6 months. The participants visited the outpatient clinic every 4 weeks when their used and unused medication from the preceding period was collected and the MEFV curve before and after inhalation of 750 μg terbutaline was determined. BHR was tested with methacholine at the start of the study, at 3 months, and at the end of the treatment period. Spirometric parameters (total lung capacity (TLC), functional residual capacity (FRC), IVC, FEV1) were measured at baseline using the closed circuit helium wash-in method. At the start of the study and at each 4 week visit MEFV curves were recorded using a heated pneumotachometer (Jaeger, Wurzburg, Germany). From the MEFV curve the forced vital capacity (FVC), peak expiratory flow (PEF), and maximal expiratory flows at 50% and 25% of FVC (MEF50, MEF25) were derived. All MEFV curves were recorded at the same time of the day. Patients were instructed not to take any bronchodilators for at least 8 hours before lung function tests. Histamine and methacholine provocation tests were performed using the 2 minute tidal breathing method. Histamine was used to determine PC20 (inclusion criterion), while methacholine was used to establish a full dose-response curve. Solutions of histamine sulphate and acetyl-β-methylcholine bromide were prepared, stored at 4°C, and used at room temperature. Aerosols were generated by a nebuliser (Model 646; DeVilbiss Co, Somerset, PA, USA) (measured output 0.13 ml/min) and inhaled by tidal breathing over a 2 minute period at 5 minute intervals. After inhalation of an isotonic saline solution, doubling concentrations (0.03–256 mg/ml) of histamine or methacholine were administered. The response to methacholine or histamine was measured as the change in FEV1 expressed as a percentage of the initial value. FEV1 was derived from the pneumotachograph readings and PC20 was calculated from these data. Histamine provocation tests were interrupted if a 20% fall in FEV1 was achieved at a histamine concentration of ≤8 mg/ml. Methacholine tests were interrupted if the FEV1 fell by more than 60%, or if unpleasant side effects occurred. After the test the patient inhaled a bronchodilator to restore the FEV1 to the initial value. From the methacholine provocation tests the log2 concentration and the measured percentage changes in FEV1 were imported to a computer program that fitted a sigmoid function (cumulative Gaussian distribution) to the data.24 Reactivity (slope of the curve), plateau values (maximal bronchoconstriction), and EC50 (concentration of the stimulus causing 50% of maximal bronchoconstriction) were taken from this model fit. The procedure was carried out essentially as described in the ATS guidelines.26 At the start of the procedure the patient was given 0.5 mg atropine intramuscularly. A pulse oximeter was applied to a fingertip to monitor pulse rate and oxygen saturation. The mouth and pharynx were anaesthetised with lidocaine spray, and the vocal cords, trachea and bronchial tree were anaesthetised with aerosolised oxybuprocaine solution (5 mg/ml) up to a maximum of 20 ml. Bronchoscopic examination was performed with an Olympus BF 1T10 bronchoscope. At least six biopsy specimens were taken from the subcarinae of both the right and left upper and lower lobes using a fenestrated forceps (FB-18C or FB-20C). Sedative drugs and/or oxygen were administered if needed. Bronchial biopsy specimens were snap frozen in Tissue-Tek II OCT embedding medium (Miles, Naperville, Illinois, USA) in liquid nitrogen within 10 minutes of collection and stored at –80°C. Once all the biopsy specimens had been collected, 6 μm serial tissue sections were cut on an HM-560 cryostat (Microm, Heidelberg, Germany). At least two sections 120 μm apart from one biopsy specimen were placed on a poly-l-lysine coated microscopic slide (Sigma Diagnostics, St Louis, MO, USA). The sections were air dried for 30 minutes and stored at –80°C until use. Immunostaining was carried out with αCD3 (UCHT1), αCD4 (MT310), αCD8 (DK25), and αCD25 (ACT-1) (Becton Dickinson, San Jose, CA, USA); αCD1a (NA1/34), αCD15 (C3D-1), αCD68 (EMB11), and αMBP (BMK13) (Dako, Glostrup, Denmark); α-tryptase (Chemicon Brunschwig Chemie, Temecula, CA, USA); αEG2 (Pharmacia). Binding of the antibodies was detected by the immunoalkaline phosphatase anti-alkaline phosphatase (APAAP) method. Sections were fixed in acetone for 10 minutes at room temperature, rinsed in phosphate buffered saline (PBS), pH 7.2, and placed in a semi-automatic stainer (Shandon, Pittsburgh, PA, USA). The slides were sequentially incubated with 2% bovine serum albumin (BSA) in PBS for 10 minutes, with 10% normal rabbit serum in PBS (Central Laboratory of the Netherlands Red Cross Blood Transfusion Service, Amsterdam, The Netherlands) for 10 minutes, and then with the appropriate monoclonal antibodies for 60 minutes at room temperature. The sections were then rinsed twice in PBS for 5 minutes and incubated with a rabbit anti-mouse (RαM) (1:50) immunoglobulin serum for 30 minutes. The slides were rinsed twice in PBS, incubated with APAAP (1:50) (Dako, Glostrup, Denmark) for 30 minutes at 20°C, rinsed in PBS and Tris buffer (pH 8.0), and incubated for 30 minutes with New Fuchsin substrate (Chroma, Stuttgart, Germany) as chromogen. Sections were counterstained with Mayer’s haematoxylin. Immunostained sections were analysed with an image analysis system consisting of a 3CCD (charge coupled device) colour video camera (DXC-950, Sony, Tokyo, Japan) mounted on a Leica DM RBE microscope (Leica, Rijswijk, The Netherlands) and connected to a Matrox Meteor frame grabber in a Pentium 200 MHz personal computer. Illumination was provided by a halogen light source connected to a stabilised adjustable power supply (12V/100W). Since the emission of light sources and the noise and sensitivity of CCD cameras are known to vary with temperature, all hardware was allowed a 1 hour warming up period to minimise unwanted thermal effects. Images were taken at 10×10 magnification. The image analysis software consisted of the QWin Standard software (Leica) running under Microsoft Windows environment. Images were analysed by drawing a line with the cursor along the reticular basement membrane. The program was set to calculate the area below the indicated reticular basement membrane up to 100 μm deep into the lamina propria. The outer perimeter of the intact epithelium was then drawn. This enabled the total area of epithelium to be calculated. Detection of the colour of interest was performed by setting thresholds for hue, saturation, and intensity. During the image analysis procedure, hue, saturation and intensity were set for each immunohistochemical stain and kept constant during the analysis of the entire study population for that particular stain. This approach allowed densitometric analysis to be undertaken, but made comparison between marker molecules impossible since density is not only dependent on the level of expression of a specific protein but is also influenced by the efficiency and intensity of a particular immunostain. Immunohistochemical data are presented as the ratio of immunostained areas and the total area of either the epithelium or the lamina propria. If the total area studied was less than 100 000 μm2 for a given subject, this subject was excluded from further analysis of that particular inflammatory marker. Results are expressed as mean (SD) unless otherwise indicated. Differences between groups in the effect of treatment and its interaction with time were analysed using the unpaired Student’s t test or the Mann-Whitney U test where appropriate. Paired data were tested for significance with the paired Student’s t test or, after log transformation, the Wilcoxon matched pairs test where appropriate. A rmANOVA was performed for the dependent variables FEV1 (as percentage predicted), FVC, FEV1/FVC, PEF, MEF50, and MEF25 after log transformation. From each of these variables, one baseline measurement and six measurements taken during the treatment period were available. The results were adjusted for the baseline measurement of the outcome variable considered. In the rmANOVA model the independent variables were time (a within subject categorical factor with six levels), treatment (a between subjects factor with two levels), and the baseline measurement of the outcome variable considered as a between subjects continuous and constant variable. The within subject residual covariance structure is assumed to be of “compound symmetry”. A p value of <0.05 was considered significant. Participants in the study had mild to moderate COPD according to ERS criteria and moderately to severe BHR. At baseline there were no significant differences between the FP and placebo groups. Asymptomatic smokers and patients with COPD had significantly different FEV1 and FEV1/FVC (table 1). Compliance with study medication was good. The percentage of returned used blister packs did not differ between the groups (92.5% in the FP group and 90.7% in the placebo group). During the treatment period no subjects dropped out of the study. Periodically, several participants noticed worsening of disease related symptoms such as coughing and production of sputum. In all cases these symptoms could be resolved with rescue medication while not violating the inclusion criteria. Adverse events were reported 25 times in the FP treated group and 28 times in the placebo group (p>0.05). Events relating to airways disease and/or study medication were reported more often by patients receiving placebo than by FP treated patients (18 v 7, p=0.02), and included candidiasis of the mouth (in the FP treated group), stomatitis, throat pain, irritation of the pharynx, upper respiratory tract infection, acute bronchitis without decrease in FEV1, and mild increase in airways obstruction. The use of rescue medication did not differ between the two groups. The mean numbers of salbutamol dosages used in the FP and placebo groups were 32.5 (27.0) and 40.4 (42.7) per month, respectively (p>0.05), and the mean numbers of ipratropium bromide dosages used were 2.2 (4.7) and 9.6 (3.0) per month, respectively. At the start of the study mean circulating cortisol levels were 360.9 (112) nM/l and 335 (87) nM/l in the FP and placebo groups, respectively. After 6 months the mean levels were 414.6 (156) nM/l and 430 (104) nM/l. The levels were not significantly different between groups at a given time point, nor were they significantly different between time points. During the 6 month treatment period the mean PC20 methacholine increased in the FP treated patients relative to the placebo group (fig 2), but this increase was not statistically significant. No significant changes in reactivity, maximal bronchial constriction (plateau), and EC50 were detected (fig 3). There were no significant treatment × time interactions (table 2); treatment effects were therefore not significantly modified in time so we can assume a treatment effect that was constant throughout time. These treatment effects (FP minus placebo) are presented in table 3. Mean PC20 methacholine during treatment period of 6 months with either fluticasone propionate (closed symbols) or placebo (open symbols); p>0.05 (ANOVA). Fitted methacholine dose-response curves showing mean values for fluticasone propionate treated patients at the start of treatment (continuous line), after 3 months of treatment (dotted line), and at the end of the 6 month treatment period (dashed line). Changes in mean FEV1 after bronchodilation are shown in fig 4A. A significant decline in FEV1 was seen in the placebo group while FEV1 in the FP treated group remained almost unchanged. The mean decline in FEV1 in the placebo group compared with the FP treated patients was 6.92% predicted before bronchodilation (p=0.027) and 7.97% predicted after bronchodilation (p=0.002). The course of the prebronchodilator and postbronchodilator FEV1 was significantly different between the two treatment groups (prebronchodilator, p=0.015; postbronchodilator, p=0.0002 (rmANOVA); fig 4B). The starting values were taken as covariants for the rmANOVA tests. The FEV1/FVC ratio (prebronchodilator) showed a similar pattern of change (mean difference 0.065, p=0.024, rmANOVA). There were significant changes in MEF50 from the second month of treatment (0.29 (0.07) l; p=0.002) and in MEF25 from the third month of treatment (0.32 (0.09) l; p=0.008, fig 5A, B). Neither FVC nor PEF were affected and remained unchanged in both groups. (A) Change in forced expiratory volume in 1 second (FEV1), (B) course of mean FEV1 after bronchodilation (both expressed as percentages of predicted normal values), and (C) course of the mean postbronchodilator FEV1 (expressed in litres) during 6 months of treatment with either fluticasone propionate (closed symbols) or placebo (open symbols). Course of (A) mean MEF50 and (B) mean MEF25 expressed as percentages of predicted values during 6 months of treatment with either fluticasone propionate (closed symbols) or placebo (open symbols). Bronchial biopsy specimens were analysed for the presence of inflammatory cells characterised by cell surface molecules and/or cytoplasmic proteins. Patients with COPD were compared with asymptomatic smoking controls. Inflammation was analysed separately in the bronchial epithelium and 100 μm deep into the lamina propria. None of the marker molecules was significantly increased or decreased in the patients with COPD compared with asymptomatic smoking control subjects. There was, however, less CD3 detectable in the lamina propria in patients with COPD than in the control group (table 4). The effects of 6 months of treatment with FP or placebo were then analysed (table 5). Compared with the placebo group, FP treatment resulted in only a marginal reduction in the indices of inflammation. Compared with baseline, CD8 was markedly decreased in the lamina propria of both groups. In the FP treated group substantial reductions in MBP and CD68 were seen in the lamina propria, while tryptase levels in the epithelium were markedly decreased after FP treatment. Other markers of inflammation were not affected, or only slightly, by the treatment. Patients with mild to moderate COPD who were hyperresponsive and who continued smoking were treated with FP (500 μg twice daily) for 6 months in a double blind, placebo controlled study. Analysis of the methacholine dose-response curves showed neither PC20 nor any other indices of BHR changed as a result of FP treatment. We have previously shown that the same dose of FP in patients with asthma with a similar degree of BHR resulted in a rightward shift in the methacholine dose-response curve.27 Studies in patients with COPD in which PC20 was determined have shown that inhaled steroid treatment had no effect on BHR.28–30 To our knowledge, this is the first time that additional indices of BHR (reactivity, plateau, and EC50) have also been shown not to be affected by steroid treatment. There was, however, a significant reduction in the decline in both prebronchodilator and postbronchodilator FEV1 % predicted (fig 4). Our results are supported by a recent study by Paggiaro et al31 which showed that treatment of COPD patients with FP (500 μg twice daily for 6 months) resulted in improvement in FEV1 and FVC. The FP treated patients had less frequent and less severe exacerbations. Clinical symptoms improved significantly and sputum production decreased. Markers of inflammation were not analysed. Treatment for 3 years with inhaled budesonide of subjects with mild COPD who continued smoking in the EUROSCOP study showed an improvement in FEV1 of 17 ml/year compared with a decline of 81 ml/year in the placebo group during the first 6 months of the study.5,6,31,32 A similar treatment period with FP (ISOLDE) resulted in a significant reduction in the fall in FEV1.33 The rate of decline in FEV1 in the group that received placebo was markedly higher than that of the steroid treated group over the initial 6 months of treatment, which is comparable with our findings. In contrast, in the Copenhagen City Lung Study long term treatment with inhaled steroids had no effect on decline in lung function in patients with mild to moderate irreversible airflow limitation.6 In a recent study patients with COPD were treated with triamcinolone for 3 years.7 A subgroup of the patients was hyperreactive. In this subgroup the rate of decline in lung function did not slow down when evaluated over the entire 3 year study period, but over the initial 6 months triamcinolone had a beneficial effect on the rate of decline in FEV1 compared with placebo. This is in line with our results which showed no decline in FEV1 in the FP treated group while in the placebo group FEV1 decreased significantly. The decline in FEV1 was most marked during the first 2 months of treatment and levelled off thereafter. The initial rapid decline in patients receiving placebo may have resulted from the withdrawal of steroids. Steroids were withdrawn at least 6 weeks before the actual treatment period, which should have been ample time to overcome a steroid weaning effect. A more likely explanation for our findings may be that BHR itself causes a decline in lung function in the absence of steroids. The beneficial effect of steroid treatment in this group of patients with COPD prevents a decline in FEV1 and keeps it constant. From our analysis of the MEFV curves, we hypothesise that the anatomical location of the anti-inflammatory effect of inhaled steroids is in the smaller airways. Significant changes were observed in MEF50 and MEF25. In contrast to other studies,31 we found no effect on FVC and PEF. This discrepancy can be attributed to differences in patient selection criteria. Although MEF50 and MEF25 are less accurate parameters of expiratory flow, the significance and consistency of this finding indicate that the effect of FP on lung function is most probably caused by an effect on the small airways rather than by an effect on the larger airways. Bronchial biopsy specimens were taken from the central airways. Eosinophils are important in the inflammatory process of asthma and correlate with BHR.35 We found eosinophils to be present also in the inflammatory infiltrate in COPD at a comparable level to that in asymptomatic smokers. It is likely that smoking and other mechanisms that recruit neutrophils into the airways in COPD cause a degree of eosinophil influx.36 Recent findings show that eosinophilic airway inflammation is common in patients with stable moderate and severe COPD.11 In our study no significant differences in changes in cellular indices were detected between the treatment groups. The CD8+ lymphocytes were markedly decreased in the lamina propria of both the FP and placebo groups. Others have reported that CD8+ cells appear to be relatively unresponsive to steroids,37,38 so the decreased level in the FP treated group should not simply be attributed to treatment with inhaled steroids. In the placebo group an increase in eosinophils was detected which coincided with the decrease in CD8+ cells. The persistent inflammation may be the cause of the accelerated decline in FEV1 in this group of patients. We were not able to detect a treatment effect on eosinophil counts in the epithelium or the subepithelium. These results are also reflected by the absence of a treatment effect on eosinophil numbers in bronchial washings and bronchoalveolar lavage fluid (data not shown). Overall, this study shows that treatment with FP has a positive effect on the indices of airflow limitation in COPD patients with BHR. In contrast, indices of hyperresponsiveness were not affected, while inflammation was only marginally reduced. Our results suggest that COPD patients with BHR benefit from treatment with inhaled steroids. The authors thank GlaxoWellcome (FLIL44/FMS40060), Zeist, The Netherlands for providing study medication and financial support. O’Shaughnessy TC, Ansari TW, Barnes NC, et al. Inflammation in bronchial biopsies of subjects with chronic bronchitis: inverse relationship of CD8+ T lymphocytes with FEV1. Am J Respir Crit Care Med1997;155:852–7. Saetta M. Airway inflammation in chronic obstructive pulmonary disease. Am J Respir Crit Care Med1999;160:S17–20. Jeffery PK. Comparison of the structural and inflammatory features of COPD and asthma. Giles F Filley lecture. Chest2000;117:251–60S. Postma DS, Peters I, Steenhuis EJ, et al. Moderately severe chronic airflow obstruction. Can corticosteroids slow down obstruction? Eur Respir J1988;1:22–6. Pauwels RA, Lofdahl CG, Laitinen LA, et al. Long-term treatment with inhaled budesonide in persons with mild chronic obstructive pulmonary disease who continue smoking. European Respiratory Society Study on Chronic Obstructive Pulmonary Disease. N Engl J Med1999;340:1948–53. Vestbo J, Sorensen T, Lange P, et al. Long-term effect of inhaled budesonide in mild and moderate chronic obstructive pulmonary disease: a randomised controlled trial. Lancet1999;353:1819–23. The Lung Health Study Research Group. Effect of inhaled triamcinolone on the decline in pulmonary function in chronic obstructive pulmonary disease. N Engl J Med2000;343:1902–9. Keatings VM, Jatakanon A, Worsdell YM, et al. Effects of inhaled and oral glucocorticoids on inflammatory indices in asthma and COPD. Am J Respir Crit Care Med1997;155:542–8. Weiner P, Weiner M, Rabner M, et al. The response to inhaled and oral steroids in patients with stable chronic obstructive pulmonary disease. J Intern Med1999;245:83–9. Chanez P, Vignola AM, O’Shaugnessy T, et al. Corticosteroid reversibility in COPD is related to features of asthma. Am J Respir Crit Care Med1997;155:1529–34. Brightling CE, Monteiro W, Ward R, et al. Sputum eosinophilia and short-term response to prednisolone in chronic obstructive pulmonary disease: a randomised controlled trial. Lancet2000;356:1480–5. Kerstjens HA, Overbeek SE, Schouten JP, et al. Airways hyperresponsiveness, bronchodilator response, allergy and smoking predict improvement in FEV1 during long-term inhaled corticosteroid treatment. Dutch CNSLD Study Group. Eur Respir J1993;6:868–76. Woolcock AJ, Anderson SD, Peat JK, et al. Characteristics of bronchial hyperresponsiveness in chronic obstructive pulmonary disease and in asthma. Am Rev Respir Dis1991;143:1438–43. Tashkin DP, Altose MD, Bleecker ER, et al. The lung health study: airway responsiveness to inhaled methacholine in smokers with mild to moderate airflow limitation. The Lung Health Study Research Group. Am Rev Respir Dis1992;145:301–10. Taylor RG, Joyce H, Gross E, et al. Bronchial reactivity to inhaled histamine and annual rate of decline in FEV1 in male smokers and ex-smokers. Thorax1985;40:9–16. Rijcken B, Schouten JP, Xu X, et al. Airway hyperresponsiveness to histamine associated with accelerated decline in FEV1. Am J Respir Crit Care Med1995;151:1377–82. Kerstjens HA, Brand PL, Postma DS. Risk factors for accelerated decline among patients with chronic obstructive pulmonary disease. Am J Respir Crit Care Med1996;154:S266–72. Tashkin DP, Altose MD, Connett JE, et al. Methacholine reactivity predicts changes in lung function over time in smokers with early chronic obstructive pulmonary disease. The Lung Health Study Research Group. Am J Respir Crit Care Med1996;153:1802–11. Finkelstein R, Ma HD, Ghezzo H, et al. Morphometry of small airways in smokers and its relationship to emphysema type and hyperresponsiveness. Am J Respir Crit Care Med1995;152:267–76. Nagai A, Thurlbeck WM, Konno K. Responsiveness and variability of airflow obstruction in chronic obstructive pulmonary disease. Clinicopathologic correlative studies. Am J Respir Crit Care Med1995;151:635–9. Riess A, Wiggs B, Verburgt L, et al. Morphologic determinants of airway responsiveness in chronic smokers. Am J Respir Crit Care Med1996;154:1444–9. Fabbri L, Caramori G, Beghe B, et al. Chronic obstructive pulmonary disease international guidelines. Curr Opin Pulm Med1998;4:76–84. European Respiratory Society. Standardized lung function testing. Official statement of the European Respiratory Society. Eur Respir J 1993;Suppl 16:1–100. Aerts JG, Bogaard JM, Overbeek SE, et al. 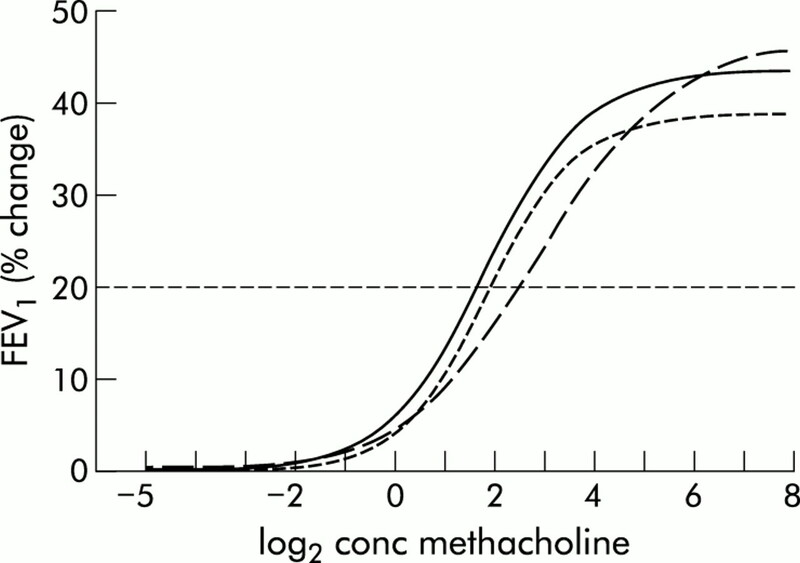 Extrapolation of methacholine log-dose response curves with a cumulative Gaussian distribution function. Eur Respir J1994;7:895–900. Lamberts SW, Koper JW, Biemond P, et al. Cortisol receptor resistance: the variability of its clinical presentation and response to treatment. J Clin Endocrin Metab1992;74:313–21. Pesci A, Balbi B, Majori M, et al. Inflammatory cells and mediators in bronchial lavage of patients with chronic obstructive pulmonary disease. Eur Respir J1998;12:380–6. Overbeek SE, Rijnbeek PR, Vons C, et al. Effects of fluticasone propionate on methacholine dose-response curves in nonsmoking atopic asthmatics. Eur Respir J1996;9:2256–62. Engel T, Heinig JH, Madsen O, et al. A trial of inhaled budesonide on airway responsiveness in smokers with chronic bronchitis. Eur Respir J1989;2:935–9. Auffarth B, Postma DS, de Monchy JG, et al. Effects of inhaled budesonide on spirometric values, reversibility, airway responsiveness, and cough threshold in smokers with chronic obstructive lung disease. Thorax1991;46:372–7. Watson A, Lim TK, Joyce H, et al. Failure of inhaled corticosteroids to modify bronchoconstrictor or bronchodilator responsiveness in middle-aged smokers with mild airflow obstruction. Chest1992;101:350–5. Paggiaro PL, Dahle R, Bakran I, et al. Multicentre randomised placebo-controlled trial of inhaled fluticasone propionate in patients with chronic obstructive pulmonary disease. International COPD Study Group. Lancet1998;351:773–80. Niewoehner DE, Erbland ML, Deupree RH, et al. Effect of systemic glucocorticoids on exacerbations of chronic obstructive pulmonary disease. Department of Veterans Affairs Cooperative Study Group. N Engl J Med1999;340:1941–7. Burge PS, Calverley PM, Jones PW, et al. Randomised, double blind, placebo controlled study of fluticasone propionate in patients with moderate to severe chronic obstructive pulmonary disease: the ISOLDE trial. BMJ2000;320:1297–303. Van Grunsven PM, Van Schayck CP, Derenne JP, et al. Long term effects of inhaled corticosteroids in chronic obstructive pulmonary disease: a meta-analysis. Thorax1999;54:7–14. Moller GM, Overbeek SE, van Helden-Meeuwsen CG, et al. Eosinophils in the bronchial mucosa in relation to methacholine dose-response curves in atopic asthma. J Appl Physiol1999;86:1352–6. Matsumoto K, Aizawa H, Inoue H, et al. Eosinophilic airway inflammation induced by repeated exposure to cigarette smoke. Eur Respir J1998;12:387–94. Corrigan CJ, Haczku A, Gemou-Engesaeth V, et al. CD4 T-lymphocyte activation in asthma is accompanied by increased serum concentrations of interleukin-5. Effect of glucocorticoid therapy. Am Rev Respir Dis1993;147:540–7. Syed F, Bingham B, Johnson M, et al. The CD4+ T lymphocyte is a site of steroid resistance in asthma. Q J Med1998;91:567–72.